Get insight about Rotator Cuff and Surgery? A rotator cuff is a group of four small muscles in the shoulder area that is responsible for the control, movement, and stability of the shoulder joint in an individual. These include subscapularis, supraspinatus, infraspinatus, and teres muscles which are collectively called as the rotator cuff. They are known as rotator cuff because these muscles exhibit rotational motion at the shoulder joint. What is rotator cuff injury? Traumatic rotator cuff injury can tear the rotator cuff tendons in the shoulder area when lifting a heavyweight or fall on the rough surface. The rotator cuff injury mostly occurs due to repeated microtrauma which can persist over many weeks, months, or years. Actually, repeated rotator cuff injury will injure the soft tissues present in the shoulder area and develop swelling and bruising. This swelling further develops impingement, squeezing, or catching of the rotator cuff tendons by separating them from the bony hood. This is a painful situation and needs surgery. Knee and Shoulder India provide excellent services for the surgery of rotator cuff injury in Chennai. What are the symptoms of rotator cuff injury? Rotator cuff injury generally shows the signs of shoulder pain and weakness in the shoulder area. It also reduces the shoulder functionality. It can be partial or full thickness tears. 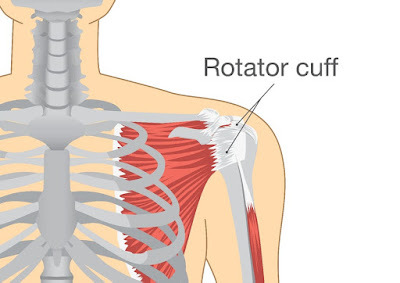 Partial rotator cuff injury shows mild shoulder pain when lifting the shoulder whereas full rotator cuff injury shows severe shoulder pain and low functionality when lifting the shoulder above. This is a highly painful situation and needs immediate treatment. How is a rotator cuff injury diagnosed? A sports doctor or a physiotherapist can diagnose a rotator cuff injury by analyzing an individual clinical history and by performing certain tests. An ultrasound scan is a perfect method to diagnose the location and size of the rotator cuff injury. MRI and X-rays also have a diagnostic ability. What is the advantage of rotator cuff surgery? Rotator cuff surgery is considered when physiotherapy is not enough to treat partial or full thick tearing in the shoulder area. In the surgery, torn tendons are sewed back together. The surgery is highly effective on fresh tear rather than old tear. The surgery took around 6-8 months to regain full motion, strength, and functionality of the shoulder. Knee and shoulder India has an expert and qualified team of doctors to perform surgery. Knee and shoulder India in Chennai has a good hold on the knee and shoulder related surgeries. The clinic has all the modern equipment and facilities for rotator cuff injury surgery.